Miller’s Art Department is here to assist you with the most challenging and time-consuming editing tasks. Our talented artists work their magic so you can get back to doing what you love – shooting. 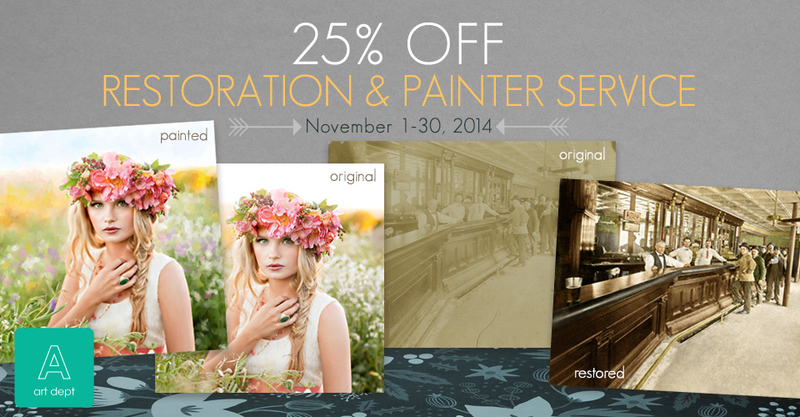 For the entire month of November, receive 25% off restoration and painter services. Restore old photographs or transform an image into a beautiful digital painting and receive your work within only 2-3 days. Please note: Promotion ends on November 30, 2014 at 11:59 p.m. (Central). I have a client who lost her husband within the last year. The only family photo that she has is an 8X10 – she wants me to transform it into a 16X20…is this an option? Please email me with the details! Thank you! I just seen your add for restoring photo’s. I have photos of my grandfather traveling to France for WWI occupation. Has photographs taken on the USS Arizona gong to France and Back on same ship. Would you folks be able to flatten out prints and improve image ?? ?